Dan Gheesling's How To Get On Reality TV Episode 46 Video : How Can I Make My Elevator Pitch Better? About The Show : Dan Gheesling was the winner of the CBS Reality TV show Big Brother. 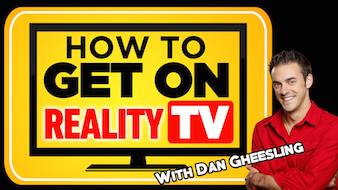 Using the knowledge he gained in the 4 years it took him to get cast, Dan created HowToGetOnRealityTV.net to help Reality TV hopefuls with getting cast. On his site you can find various sources of information to aid in your casting journey: books that take you step-by-step, a video course that walks you through building your story and he also reviews audition videos and provides feedback. Dan also hosts a weekly podcast where he answers viewer/listener questions in an effort to help the HTGRTV community with specific casting questions. You can find the podcast at HowToGetOnRealityTV.net​, iTunes​, and Youtube.